I don't know the dates of the 2013 La Ceiba Carnival, do you? Update: The final big celebration and parade are scheduled for May 25, 2013. I'll post the schedule of events if and when I can get it. 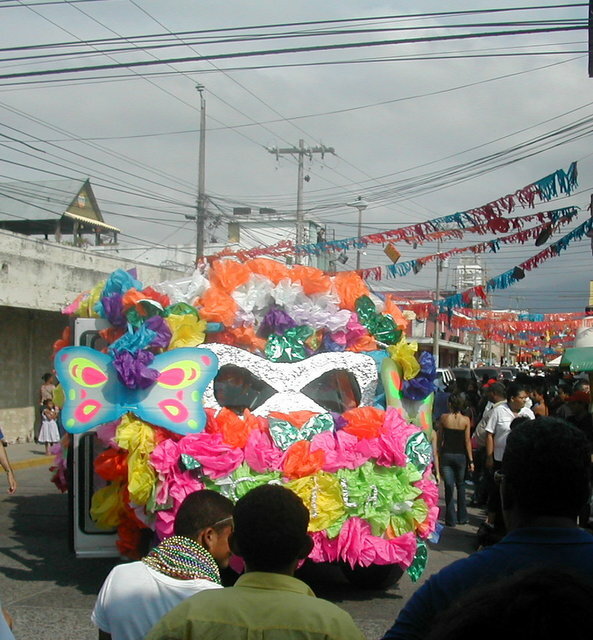 When is the La Ceiba Carnival? That question pops up every year and every year I make fruitless attempts to find an answer including emailing the municipal tourism office. Oh, I know that Wikipedia used to say that it is the third week of May, but that has been corrected to "the third or fourth week of May". Besides, it is a two week event, though most people are referring to the last big day of the parade and all night partying when they speak of 'the carnival'. I remember one year Ceiba's tourism office set up the dates about a month in advance....and then changed them at the last minute to start a week later. I felt sorry for anyone who had already arranged their vacation and bought plane tickets based on the previous calendar of events. Similarly, the big parade itself can be delayed for hours and hours due to disorganization or waiting on some dignitary to arrive. "You're ordering rice and potatoes?" "Because you just don't. You don't eat rice with potatoes. That's two starches. It's not allowed!" "Whatever. It's good. You should try it." Actually, I have tried it. There is no way around it. 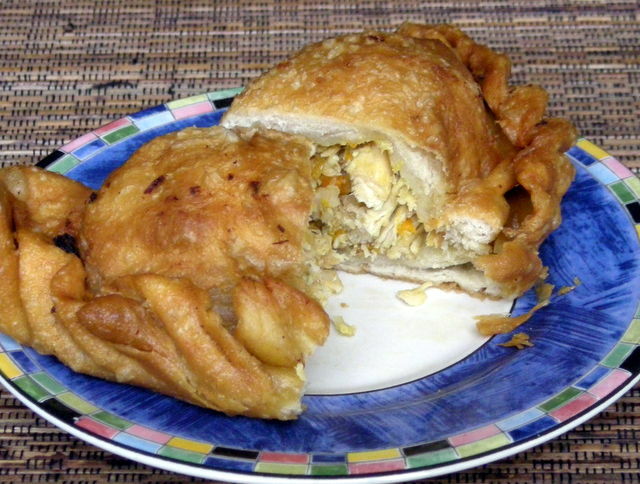 Yummy pastelitos (fried meat pies) often come with rice and potatoes inside. So do many tamales, including the ones I make. President Pepe Lobo, "What's the worry? It's for democracy!" President Lobo is pushing hard for a 'gag' law that would seriously curtail freedom of speech and freedom of the press in Honduras, in emulation of what Hugo Chávez accomplished in Venezuela. Under this proposed gag law, media sources speaking critically of the government could face fines in the millions and even loss of their license under what the press is calling confiscatory measures. The proposed law is said to call for a censure committee and to also give the President discretionary rights to regulate all media, including deciding what is information and what is not, who is granted frequencies and who is not, as well as the final discretion to revoke or confiscate media as he sees fit. While the law will apply to online news sources, it's unclear whether it could be also applied to personal blogs. While Lobo claims there is no intent to previously censor any news or confiscate private property, fines for violating the new rules range from 3% to 5% of gross annual income! The penalty for repeat violations can mean license revocation. Self-censorship among reporters is already a huge problem in Honduras where dozens of radio, television, and print journalists have been murdered in the past 10 years and where lucrative government advertising contracts can make or break a radio or television station and likely has a major effect on the slant given to the news. There is no time limit on Honduras residency once it is granted, but you do have to go renew your residency card and prove that you still meet the requirements every year or five years, depending on the type of residency. Every single year, my stomach ties itself in knots when that time comes around. I'm sure that when I present my old card at the extranjero (foreigners') desk for renewal, I'll find that there is a migratory alert out for me and they'll give me 24 hours to get outta Dodge. "Oh, you are that gringa with the blog? Ahah! We've been looking for you!" This is totally irrational, I know. Or I think I know. Or I think that it probably is. That's what El Jefe tells me anyway. He wouldn't say this, but I think that he thinks this fear is idiotic. And it probably is. Or maybe it is. I hope it is. I have contaminated my Catracho with gringo thinking. I've created a monster. I admitted several years ago that I have the US American 'complaint gene'. Americans tend to think that anything that doesn't "make sense" or isn't "fair" must be rectified! And we tend to think that all we need to do is to point that out for justice to be done. Unfortunately, the complaint gene is not appreciated so much in Honduras. El Jefe is a pretty laid back guy. He accepts that nothing is going to be quick and easy, that the store is probably not going to have what we need, and that the repairman will probably not show up when he is supposed to. He still takes all that in stride. He is Honduran, after all. But living in the US for awhile has given him a different perspective as it has for many returning Catrachos. That is compounded by years of reading the Blogicito and listening to my opinions. Lately he sometimes has been taking it to the extreme. He has a personal mission to teach customer service in La Ceiba. He chides clerks and waiters when they are rude or do stupid things. He tells them how they should have answered a question from a customer and even goes so far as to remind them that if they don't treat the customers right, the customers will go somewhere else, the store or restaurant might close, and they would be out of a job and then WHAT?! Jobs are hard to find in La Ceiba. If they don't have a product they used to have, he gives them a lecture in inventory control and asks them how they expect to make money if they don't have the things that people want to buy. Even I, the gringa, thinks that he goes too far sometimes. This isn't the USA. I might give him a nudge with my elbow, an alarmed look, or simply slink a little bit away, you know, as if I'm not really with HIM. You know, they way HE used to do with me when, shocked at some horrible customer service event, I would make a spectacle of myself demanding that yes, I should receive the item I just paid for and that if they don't have it, no, they don't get to keep my money and make me buy something else that I don't want or need. Recently I bought a blouse at Carrion at the mall. The first day I wore it, part of the side seam ripped open. "We need to go take this back right now!" declared J. "I'm not taking it back," said me. "It's easy to fix a seam and I probably did it climbing into the truck." "No, we need to take it back." "Please! I don't want to go through the hassle of trying to take it back!" Grumble, grumble, he retorted. He's not the only one I see that way. Sometimes I'm confused by Hondurans who come into a store or other business griping loudly about something and being unnecessarily rude to the employees. I wonder how it is that they get action when my reasonable complaints didn't. Maybe it has to do with the caste system. Maybe I just don't dress well enough or carry an expensive enough cell phone. This personality change is quite the turn from 2001 when I wanted to take back a 2-month-old stove to San Pedro that had rusted. At that time, he thought it was crazy to even try and only grudgingly agreed to take the bottom drawer back to show them. Eventually I got my new stove but what a hassle! For a stove it was worth it the aggravation, but for a blouse? Not for the new, Honduranized gringa. I know when to pick my battles now. El Jefe hates corruption as much as I do. After reading the newspaper or watching the news, he'll say, "Why don't they do xxxxx or xxxxx to put a stop to it?" "Because this is Honduras? ", the now mellowed gringa meekly offers. Talk about trading places! I couldn't count the number of times over the years that he answered my frustrated questions with that even more frustrating answer. 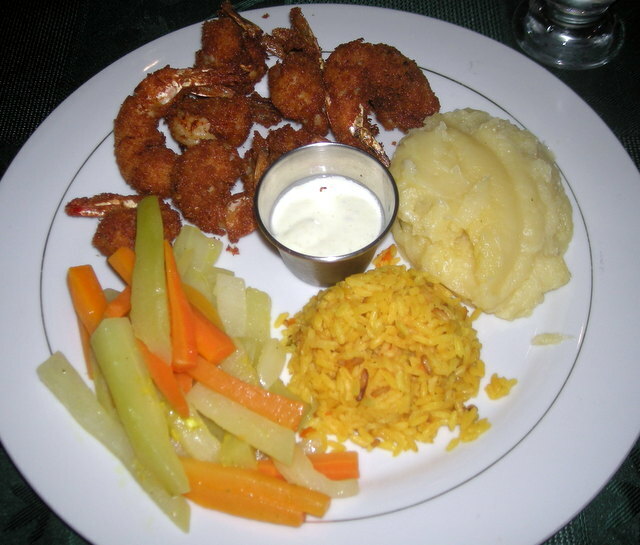 What is your best or worse consumer experience in Honduras? Please share it with us in the comment section! Thank you, Blogicito Readers, for all of the congratulations you've sent recently! I spent all morning one day replying to everyone who wrote. I really appreciate your readership. 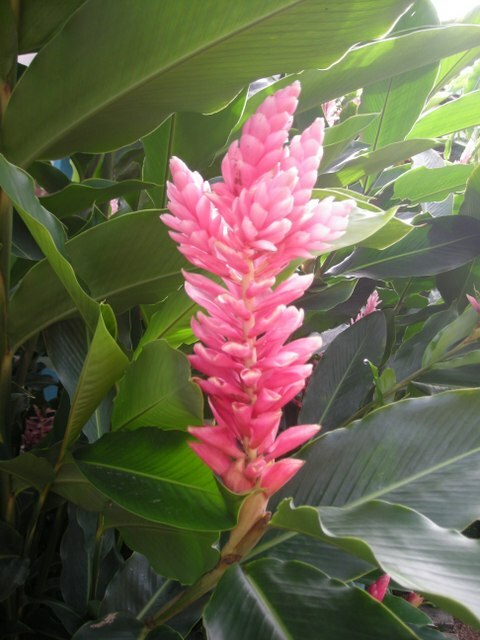 Pink ginger - smells so good! On a similar note, I was so encouraged by the avalanche of email and comments I received on my return to the blogosphere a few months ago! I was absolutely floored when I opened my email the morning after my first come-back article. I meant to write this thank you much earlier and then got sidetracked. I wasn't able to reply to all the emails and I apologize for that but I wanted to let the readers know how very much I appreciate all of your comments. I'm so happy that you are still out there. Thank goodness for the Feedburner email updates or you'd probably never know I was back to blogging again. I wouldn't have blamed you if you gave up on me. Oooooh! 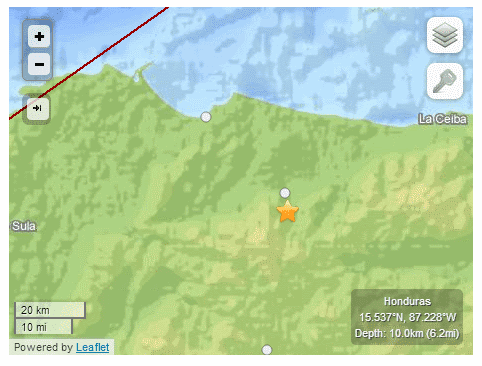 We just felt an earthquake in La Ceiba. It lasted several seconds and based on my memory of 2009 when we had so many, I'd guess that it was at least a 5.5. The stuff on top of my desk was rattling like crazy. At first I just sat there experiencing it, but when it didn't pass after a few seconds, I decided it was time to get out of the house. I saw Arexy paused like a statute on the terraza steps. Before I could get outside, it stopped. I wrote that and then I had to go chat with everyone around me. El Jefe was driving on the highway and did not feel it. Our Honduras Living group was getting messages from expats in La Ceiba, San Pedro, Roatán, Tegucigalpa, La Lima (Cortés), Danlí (El Paraíso) who all felt it. 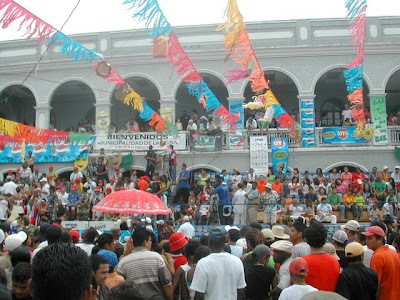 Two people who were in Trujillo and the island of Guanaja did not feel it. Not to brag – well, maybe a little! – I guesstimated 5.5 right after it happened. The USGS is now showing it as a 5.5 on the Richter scale. I tracked all of those 2009 earthquakes and since I blogged about most of them, I guess my memory is working pretty well. 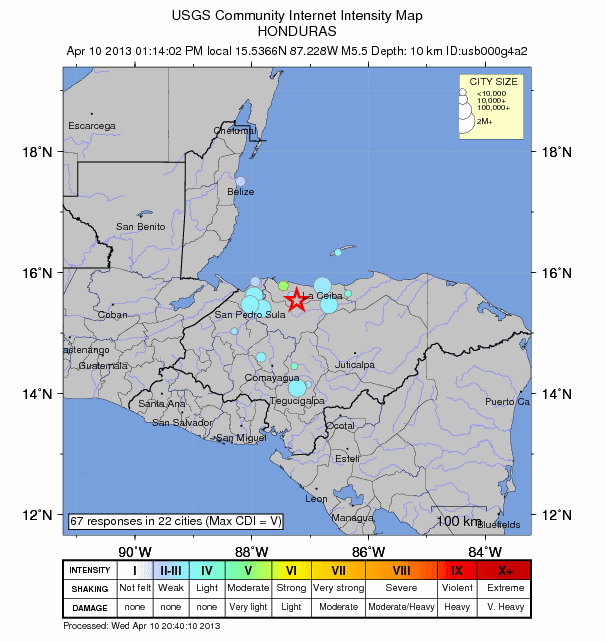 I had never experienced an earthquake before moving to Honduras and they made a big impression on me, especially the 7.3 quake that had us running through the dark to get out of the house. The USGS earthquake website gives the epicenter as 5 km. (3 miles) south of San Juan Pueblo and about 36 km (22 miles) southeast of Tela, Honduras. 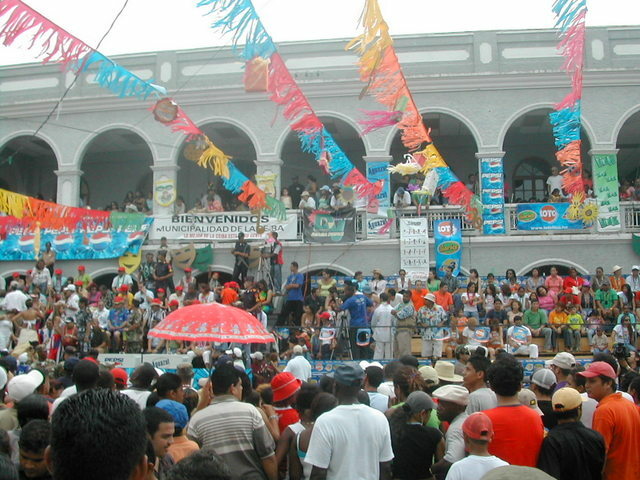 San Juan Pueblo is roughly halfway on the highway between La Ceiba and San Pedro Sula. We were checking the television, but not much was known at the time about damages. I just checked again, and Canal 3 is saying that there are no reports of damage so far. I guess Honduras was lucky again. We'll no doubt get more details on the 5pm news. La Prensa is reporting that Tela lost power and telecommunications but that there was no damage reported. Jocon, Yoro y Olanchito reported fissures in some buildings and homes. La Prensa also gives a whole page of earthquake safety tips. The following map indicates the "Did you feel it?" reports received by the USGS. I always encourage people to report what they felt. You can do that with the DYFI online form. I think it helps the USGS refine their data. The blue bubbles represent reports of feeling the quake. Question: Are there any earthquake experts out there who can explain why the depth is almost always given as 10 km? Just curious. David and Delmy came to visit today. What a shock that was! I was so happy and relieved. I was really thinking the worst had happened. He got back home last night, courtesy of the US government. They sent him to San Pedro Sula, where he says the plane was met by Honduran Immigration who gave them something to eat and drink and money for a bus ticket to La Ceiba. I didn't think that Honduras did that. I thought it was a private organization that I've read about many times in the news, but he thought that it was the government. He was captured when on his way from McAllen to Houston with about 20 other people and a coyote. The coyote and a few of the others got away. They had been walking from 6 am to 6 pm for four days through the countryside with a guide. A pregnant El Salvadoran was with them. Her leg swelled up with so much walking until she couldn't walk anymore. Two other men started carrying her. That slowed them down and he thinks that was part of the reason they were caught. He also said that some farmers saw them and probably reported them. I'm not sure exactly where he was detained. I told him I had been checking the ICE detainee locator and that he never showed up on it. He said he was transferred two or three times. Each time the guards would come and tell him, "Get ready. You're leaving." He would think they were sending him home but instead, he would be transferred to another prison. What a let down. Makes me want to go make one right now! See You must try grilled pizza for my basic grilled pizza instructions and then read on. It is so much easier to figure new things out if you first see it done, no? That is always true for me. Thankfully in the internet age you can do that! YouTube has some videos on grilling pizza that you might find helpful, especially for seeing what your cooked dough should look like. Steve Raichlen shows the appropriate enthusiasm for grilled pizza. (Ignore the lake of olive oil in which he stretches the dough – you really don't need that! A small amount of flour or oil on a pastry board will do.) This video by BBQ Pit Boys makes me laugh – a real man's guide to making grilled pizza (notice he uses a small machete to cut it). He tops the pizza dough before cooking, but I still suggest using the two step method of cooking the top first. BBQMyWay has another manly-man video – listen to the crackle! It's true. Ours crackles like that when we cut it. It is a beautiful sound. If you don't have an outdoor grill, check out Laura Vitale's video on grilling pizza on a stove-top grill. If you are a homemade pizza virgin, Laura has another video that goes through the whole dough making, sauce, and baking process. Don't let making dough intimidate you. Pizza dough is much more forgiving than bread dough. If you prefer Spanish, here's a video for you. This one includes preparing the dough. YouTube has other pizza a la parrilla videos in Spanish, too. For the grill, I recommend the two-step process rather than topping the raw dough at the beginning as some videos show. I think that you'll get a much crisper, more evenly cooked crust using the cook-turn-top-cook method. I also think it is easier for the beginner. Watch a few of these videos and you'll see that there are no hard and fast rules for grilling pizza. It is an art, not a science. In discussing all of this with El Jefe, since he is the main pizza chef here, he pointed out that there are a lot of variables. Differences between grills is a big one. Another big variable is the thickness of the dough. He said that a thin crust will burn a lot faster than a thicker one, so you may need to use a slightly lower temperature if your crust is very thin. Square - for a change. Isn't it a beauty? We haven't found it necessary to oil the grill grates or the dough disk before grilling, but you might want to oil your grates the first time if you aren't sure whether or not it will stick. Do make sure the grates are clean, though, as any bits of crud from your last barbecue will stick to the dough. He also told me about other temperature adjustments he sometimes makes, but since that might only apply to those who have the same kind of grill that we do, I have another idea for beginners. Make a small extra disk of dough from your same dough batch, stretched or rolled out to the same thickness as your pizza dough. Use that to test your grill temperature and cooking time. In the beginning, El Jefe oiled the grates before putting the dough on the grill but after a time he discovered that our well-used grill has developed a nice, shiny, non-stick coating from lots of use so he doesn't do that anymore. If your test crust sticks too badly, you can either oil the grates or oil the bottom of the dough before placing it on the grill. If it cooks too fast or too slow, adjust your grill temperature accordingly. One bit of advice from me is that a slightly firmer dough is easier to handle on the grill, though a soft dough is not impossible after you get some experience. If you live in a hot, humid tropical climate with an un-airconditioned kitchen, keep your dough cool after shaping. Cover it with a barely damp towel and/or plastic wrap and stick it in the fridge if you can't get it on the grill right away. The dough will be easier to handle when cool. We find this particularly true for doughs containing sourdough starter. Tip #1 - Don't let the shaped dough stick to your peel or baking sheet. Use lots of corn meal, semolina flour, or regular flour on your transfer device. On smaller pizzas or if the dough is being fussy, sometimes we just pick the untopped disk up from the pastry board with our hands and drop it onto the grill. Use care if you try that. Tip #2 - Don't go too big. Until you get the hang of manipulating the dough onto the grill, two medium to small pizzas are much easier to handle than one big one. Similarly, don't go too heavy on the toppings. Tip #3 - Give it a rest. If you are having trouble rolling or stretching your dough, give it a rest for 5 or 10 minutes and then continue shaping. Dough springing back is a sure sign that the gluten needs to rest again. Be sure to cover it with a damp towel or plastic wrap so that it doesn't dry out during its nap. Tip #4 - Live with less than perfect circles. When the dough slides off the peel to the grill, it tends to stick to the hot grates of the grill and get somewhat misshapen. Unless you are very lucky, you won't be able to push/pull it back into shape before the dough sets. Just remember, if it isn't a perfectly round Pizza Hut pizza, it is a 'rustic' or 'artisan' pizza which makes it even more valued. Tip #5 - Be prepared. Have all of the toppings ingredients and implements ready to go grillside before you put the dough on the grill. There really is no time to go searching for something in the kitchen once you have put the dough on the grill. Tip #6 - Don't go anywhere. Your dough should only need about 2 to 4 minutes on the first side. If it takes longer, that means that your grill was not hot enough. Grills are not as accurately temperature controlled as an oven, especially if it is a charcoal grill. The crust will miraculously tell you when it is ready to turn: if the dough sticks to the grates, it isn't ready so don't force it. As the dough cooks, the grates will release the dough so it's easy to check the bottom for doneness. Tip #7 - Know your hot spots. If your grill has hot spots, be sure to avoid them if possible. Rotate the pizza once on each side so your crust cooks evenly and doesn't have burned spots. You can rotate more often, but remember that every time the grill is opened, it will be losing heat. Can you tell who was manning the meatball bowl? I want all my friends to try grilled pizza! I highly recommend it. I'm pretty sure that once you've tried pizza on the grill, you'll never go back either. I'd love to hear your experience if you try it. Please come back here to tell us about it. And if you have any questions that you think that El Jefe or I might answer, please feel free to ask away in the comment section below. Grilled pizza? Who knew? Not me. I didn't see how it was possible to bake a pizza on a barbecue grill. Wouldn't the dough fall through the grates? Wouldn't it burn to a crisp? In looking for the perfect pizza dough (more on that below), I kept running across people raving about grilled pizza. Apparently it is the next best thing to having your own wood fired brick pizza oven. El Jefe thought I was kidding when I suggested we try it. "Pizza on the grill? Are you sure?" "No, but let's try it anyway." We are converts now. I don't think I would ever bake a pizza in the oven again. There is just no comparison of the taste and texture of a grilled pizza versus home oven baked or even pizza chain pizza. Really. You just have to try it to see for yourself. Another interesting thing is that I've always liked thick crust pizzas, but now I prefer a crispy thinner crust. I'm not going to give a pizza dough recipe. There are so many recipes out there that claim to be the 'perfect' dough so just try some and see what suits your fancy. 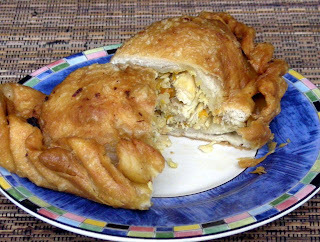 One that I like is the recipe that came with my Zojirushi bread maker, but I've tried several different recipes and they all turned out great on the grill, each a little different in taste and texture. I sometimes set aside a portion of dough from my sourdough bread recipes to use as pizza crust. If I come up with a recipe that stands out over the others, I'll post it. In the meantime, I'm enjoying experimenting with different dough recipes. I've read that in the US, you can buy prepared pizza dough in a bag at the grocery stores and that it is good, too. The one thing you won't want to use is a pre-baked crust. Most pizza dough recipes make two crusts or more, or a larger pizza than we need for two of us, so after the first rise, I freeze the extra dough in disks in resealable sandwich baggies sprayed with a little cooking spray inside. Then I put those bags into in a freezer bag. Just pull out a baggie of dough and let it thaw in the fridge overnight if you have time or leave it on the counter at room temperature for spur of the moment pizza. For the size we use (usually about 10-12 oz. of dough), it usually thaws within a couple of hours. I get panicky when my pizza dough stash gets down to one ball. You can also store any extra dough in the fridge for three days or maybe up to a week some say. Refrigerating the dough for at least a day or two adds to the depth of flavor. If you do that, be sure to oil the dough and wrap it well so that it doesn't dry out. Freezing the dough doesn't alter its quality at all. Don't get too carried away though. Plan on using the frozen dough within a month or two for best results, especially if you are in a country with frequent power outages. Speaking of freezer stashes, we've gotten so organized that we really can have pizza at the spur of the moment with freezer stashed pizza-sized batches of dough, sauce, pepperoni, meat balls, and grated cheeses (mozzarella and parmesan). I like to buy the big sticks of pepperoni and slice it with my Cuisinart. I think it is much cheaper that way. I've made pizza sauce with a base of tomato puree, canned spaghetti sauce, fresh tomatoes, canned diced tomatoes, and every combination of those ingredients that I've had on hand. I usually saute garlic and onions, add Italian seasoning and a tiny pinch of cayenne pepper. Some people just use sieved canned tomatoes. It's all good. Depending upon your tomato source, you might want to add a teaspoon or two of sugar to combat the acidity. You will want a thick sauce so it doesn't make the crust soggy. Of course, you can make it really easy by buying prepared pizza sauce in a jar. 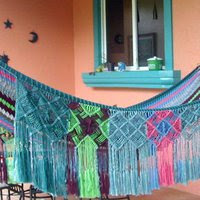 It is even available in the major cities in Honduras, but it is more economical to make your own. I usually make a large batch of sauce and freeze it in pizza sized amounts for quick pizzas. I pour serving-sized portions into custard cups and then freeze them. When the sauce is frozen, I dump the frozen disks into a freezer bag. When you are ready to make pizza, pull out what you need and put it back into a custard cup to thaw. With some preplanning, you can literally make your own pizza in the time it would take to have one delivered. Just as a general guide to grilling pizzas, I'll outline the steps that we use. First, our grill is an infrared heat grill. It loses heat VERY quickly when the lid is opened. Your grill may behave totally differently and you may need more or less time. I don't have any experience grilling pizza on a charcoal grill, but I do know that you want hot coals, not flames, and that you probably need to build the fire on one side and leave one side 'cool'. The thickness of your pizza (both of the dough and the amount of toppings) will also affect the time needed. Second, we don't have a pizza baking stone so we are cooking the dough directly on the grill grates. Baking stones work great if you have one, but of course, the pizza will brown without the grill marks. If you have access to a big comal over a wood burning fire, that would be perfect, too. Cooking the dough is not that different from cooking tortillas. One of the keys to a good grilled pizza is to be organized. Prepare all of your topping ingredients and put them in little bowls (or big ones!) on a tray that you can carry outside. El Jefe keeps a small plastic squirt bottle (formerly for soy sauce) filled with oil for all of his grilling. It's much easier to get the quantity you need that way and you don't have to worry about dropping the bottle. Also put a brush for the olive oil, a big spoon to spread the pizza sauce, and tongs or a spatula on the tray. If your grill doesn't have a shelf, pull up a table or chair on which you can put the tray. Preheat the grill on one side to its highest setting (15 minutes on our infrared gas grill). El Jefe usually turns the temperature down a notch at this point (from 'preheat' to 'sear' or medium-high). Slide the dough from the pizza peel or the back of a baking sheet directly onto the hot grates. Close the lid and grill for 2 to 4 minutes. If possible, peek in from an opening in the back to keep an eye on the dough's progress rather than opening the lid to check. When it is ready to turn, the top will not be browned but will show some 'firming up' and will look drier than the dough originally looked. You may see some big bubbles in the dough and that's okay. The bottom should be lightly browned with some nice dark brown grill marks. Pick up the partially cooked dough with the peel, a big spatula, or your fingers (be careful!). Flip the crust over onto the "off" side of the grill and brush the top (formerly the bottom) with olive oil. The olive oil helps to prevent the sauce from making your dough soggy. Top with sauce and your other ingredients. We like to put a little cheese under the toppings and more on top of the toppings to 'glue' them down. Work quickly so that your grill doesn't cool off too much. Slide the topped pizza back over to the direct heat side and close the lid. Cannot get a good photo at night! If you are making more than one pizza or your grill doesn't have more than one heat zone, you may find it more convenient to remove the crust to a pizza pan, a flat edged baking sheet, or a pizza peel, to top it at the table and then return it to the grill. We did that when we had a pizza party for nine people. We needed to keep the assembly line going and maintain the grill hot by keeping the lid closed, and, most importantly, we didn't want the kids to burn themselves on the grill while they were topping their pizzas. Kids love to make their own pizzas! After topping the pizza, return it to the hot side of the grill and grill for another 2 to 4 minutes until the cheese is fully melted and the bottom of the crust is nicely browned. I love those grill marks on the crust! If the crust seems to be cooking too fast (overbrowning or grill marks too dark) turn the temperature down just a little. The second side could take a couple of minutes longer depending upon how much heat your grill lost during the topping and how thick your pizza is. Goodbye Pizza Hut, Domino's, and Toto's (our only choices in La Ceiba). It was nice knowing you before I discovered homemade grilled pizza. I doubt I'll ever see you again. Farewell. Sorry, but I have a better pizza than you! Is my excitement contagious? Are you itching to try it? Before you jump in, please check out the next article, in which I'll give you some more tips and resources to boost your self-confidence and make you drool for grilled pizza. La Gringa's Blogicito was selected as Expat Blog of the Month for April by Expat-Blog.com. This is the first time a Honduran blog was selected. Yay! I appreciate the honor. You can read my interview here if you are interested. Welcome to the visitors from the Expat Blog website. I hope you'll be back to visit again.